In the beginning . . . With more and more women now taking their place in surf spots around the world, gaining confidence and finding that they belong out there as much as anyone, it's tempting to think that women's surfing is a new phenomenon. But females have been surfing for longer than you think. In fact you could say that women have always had a kinship with the waves. The ocean is, after all, femaleask any poet. Maybe it's because the sea can be so beautiful and full of life, stormy and quiet, gentle and powerful, all at once. There are myths about women surfing long ago in Tahiti, Aotearoa (New Zealand), and Rapa Nui (Easter Island). And don't tell the guys, but according to one Hawaiian legend, women even learned to surf before men: when Kamohoali'I, the shark god, taught Pele, the goddess of volcanoes, how to surf. Why the history lesson? Why is any of this important? It goes without saying that you need to look where you're going when you're learning something new, but a glance backward through time, learning about the people who cleared the path and understanding how surfing evolved, can be both informative and inspiring. If women could learn to surfand surf wellwhen surfboards weighed a ton, there were no surf schools, and boardshorts and leashes were yet to be invented, then hey, maybe it's not so hard after all. It's also important to know our roots. The history of surfing has been well documented over the years, but often with a subtle bias. You'd be hard pressed to find a surfer today who's never heard of Midget Farrelly, the first men's world surfing champion. But who's heard of Phyllis O'Donnell, the first women's world champion, who stood beside Midget on the winner's dais at the first World Championships, held at Sydney's Manly Beach in 1964? It's not a conspiracyjust a side effect of the way events were recorded in those days and the amount of media coverage devoted to women's eventsbut it's not the full story either. Of course, a comprehensive history of surfing including the advances made by men and women would fill an entire book by itself. So the role of this chapter is to shine a light on a few of the women who have been part of the evolution of surfing. 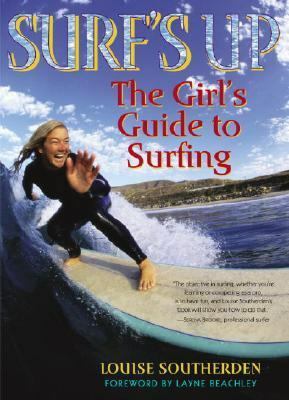 (By the way, if you're eager to get to the nitty-gritty of learning to surf, feel free to go straight to Chapter 2. That's the beauty of history: You can always come back to it later). Think of it as looking back over your shoulder at all the dedicated surfer girls who have gone before you. Of course, women's surfing isn't separate from or superior to (or inferior to) men's surfing. But women are part of the bigger picture and, if the truth be known, always have been. In fact we're making history right now just by getting out there and making women's surfing visible once again. Hawaii, a.d. 4 Imagine yourself in the middle of the Pacific Ocean, on a small group of islands that have always loomed large in surfing's history: Hawaii, the birthplace of modern surfing. Now turn back the clock two thousand years to a.d. 4 when Polynesians started coming ashore. It's hard to imagine a race of people more in sync with the ocean than the first Polynesians, particularly those who braved the long voyage to Hawaii. Of course, they already knew how to surf, but they did it lying down on short flat belly boards called paipo. It was the Hawaiians who took surfing up a notch, literallyby standing on longer surfboards. Surfing was huge in Hawaii before European settlement, and it wasn't just a guy thing. Whole villages of men aSoutherden, Louise is the author of 'Surf's Up The Girls' Guide To Surfing', published 2005 under ISBN 9780345476616 and ISBN 0345476611.